If you decide to come to Magadan then you will need to apply for a Russian visa at one of the Russian Consulates in USA. We will send you a letter of invitation to Russia and a confirmation for a tourist visa, which are required by the Russian Consulates. The invitation gives the grounds for getting a visa from the Russian Consulate, but is by no means a valid entrance document in itself. We send you a letter of invitation as soon as you decide to hunt with KULU Safaris and mail us your passport data. We usually recommend our clients contact CTTDestinations to get help with applying for and getting visas at the Russian Consulate and/or with booking airline tickets to Magadan, Russia. CTTDestinations will inform you about documents you will have to produce; they will apply to the Russian Consulate for you, and when your visa is ready, you will have it sent to your address. Currently the flight Anchorage-Magadan-Anchorage is discountinued. In this situation the only way to come to Magadan is via Moscow or Seoul (South Korea). Our reliable partners in Moscow and in Khabarovsk (if you fly via South Korea) will meet you at the airport of Moscow, help to go through Customs and transport you to the domestic airport to put you on the Magadan flight or take you to a hotel if you need to overnight in Moscow. On the way back they will help you catch your next flight, stay in a hotel, get your rifles and skins through. Magadan is a seaport town in the North-East of Russia on the coast of the sea of Okhotsk below the 60th parallel. 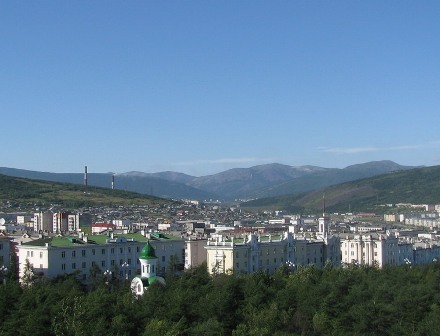 Magadan (population 140 000 people) is the capital of the Magadan region main industries of which are gold-mining and fishing. The Magadan region is a mainland area; it is close to the Kamchatka Peninsula. Our neighboring regions are the Khabarovsky region, Yakutia, Chukotka, the Koryak region.